While dental cavities can be a nuisance, they are not an uncommon problem for patients. At one point or another, most patients will have a cavity that requires treatment. In fact, many patients develop cavities several times throughout their lifetime. Because tooth decay is such a common problem, the Manhattan cosmetic dentists of Fine Dental, Dr. Scott Fine and Dr. Shawn Salehezadeh, offer a number of cavity treatments. The most appropriate cavity treatment will be chosen based on the extent of tooth decay that has occurred and the amount of restoration and protection that is required to ensure the tooth’s health. Dental cavities typically form slowly. Once plaque and tartar build up, they begin to slowly eat away at the enamel of the tooth. This tooth decay progresses, creating a cavity, or small hole, in the tooth. If the cavity is detected early on, more conservative treatments can be effective. However, if the decay is not identified and treated in its early stages, more aggressive treatments may be necessary. Dental fillings: A dental filling is usually the first choice for cavity treatment. If tooth decay is mild, a dental filling can effectively treat a tooth by replacing lost enamel and sealing off the tooth. This is done by applying composite material (or a restorative material of the patient’s choice) directly to the surface of the tooth. This material is then molded to fit the tooth and finally sealed to block out bacteria. Inlays and onlays: Inlays and onlays are an ideal treatment option for a tooth that has more extensive decay. A tooth can be restored with an inlay or onlay if there is decay present on the biting surface of the tooth (or on one or more of the tooth’s cusps). An inlay or onlay is similar to a filling in that it replaces lost tooth material and seals off the tooth. However, like a dental crown, inlays and onlays are fabricated in a dental lab using a mold of the tooth. Inlays and onlays can repair more damage than a dental filling, but are still a more conservative treatment than dental crowns. Dental crowns: For patients in Manhattan, dental crowns are recommended for only the most advanced cases of tooth decay. 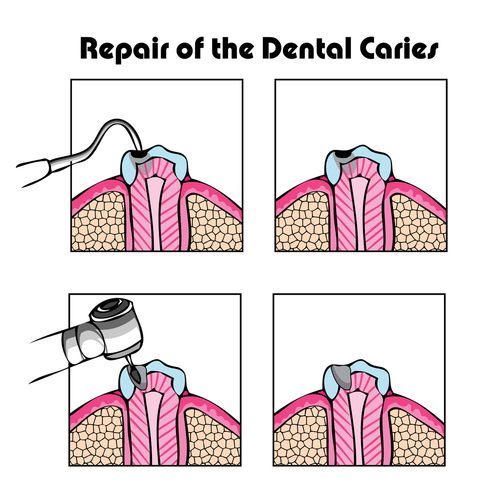 A dental crown can restore a tooth that has suffered from severe tooth decay. The tooth will be filed down to remove all traces of decay and then it will be entirely surrounded by the dental crown. This is one of the more aggressive treatments for tooth decay, but it can restore a tooth’s strength and function and can prevent the loss of the tooth. Generally, the Manhattan dentists of Fine Dental can treat a dental cavity and repair the damage caused by tooth decay using one of the above treatments. In very rare cases, tooth extraction may be recommended. In these cases, a restorative option will be recommended to replace the missing tooth. The best way to ensure healthy teeth and avoid the need for aggressive dental treatments is to maintain routine dental care. With regular dental exams, the Manhattan dentists of Fine Dental can help patients manage their oral health and treat any dental problems in their earliest stages. Schedule an appointment with the experienced dentists at Fine Dental.